Every day, thousands of surfers use Genkiosk Internet Access Software to get online, accessing emails, news sites, social or corporate networks and much more. Genkiosk offers an easy way to get up and running with a paid internet network and gives you complete control and peace of mind. Without constant supervision your kiosk estate is susceptible to external interferance. Genkiosk provides standard lock-down functionality to ensure you kiosks are not at risk. Genkiosk's integrated payment portal allows you to offer internet as a genuine self-service so you no longer need to man your internet cafe. Manage your estate via the Genkiosk online management software. Get detailed kiosks eastate analytics, to manage your business via fact-based decision making. 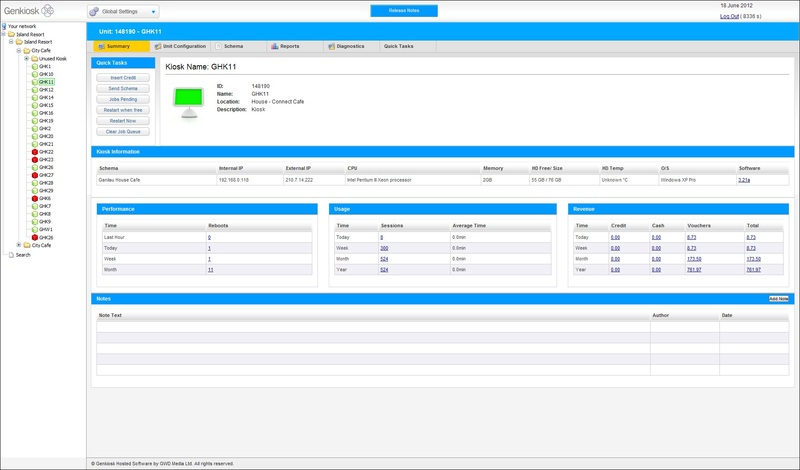 Genkiosk keeps a full audit trail to allow you to troubleshoot any issues and ensure you're never in the dark. Actively manage and control content on the kiosks via a flexible white list. Despite the inexorable march of Internet-via-Smartphone, Genkiosk spots a gap in the market for internet kiosk and Wi-Fi providers.